In the previous post we established that the usage of default constructor required by NHibernate is theoretically not required. The fact that NHibernate does use them though has to do with technical limitations of CLR. Turns out in most cases there is a workaround, which is not perfect but was a fun experiment to implement. The code presented here is just an experiment. It is not of production quality – it is merely a proof of concept so if you use it in production and the world blows up, don’t blame me. The place that NHibernate lets you plug into to instantiate entities and components as they are pulled from database is in NHibernate’s IInterceptor (not to be confused with Castle DynamicProxy IInerceptor) interface and its instantiate method. NHibernate has also a IObjectsFactory interface but that one is used to instantiate everything including NHibernate’s own infrastructure (like IUserTypes for example) and we want to override only activation of entities and components. The code here is straightforward. The INHibernateActivator is a custom interface that we’ll discuss in details below. That’s where the actual activation happens. We’re also using ISessionFactory so that we properly set the id of retrieved instance. Turns out that is not enough. In the interceptor we activate objects we fully obtain from the database. However big part of NHibernate performance optimisation is to ensure we don’t load more data that we need (a.k.a. lazy loading) and to do it transparently NHibernate uses proxies. For every persistent type NHibernate uses object called proxy validator to ensure object meets all the requirements it has to be able to properly proxy a type and that work is done by IProxyValidator. Part of the work of proxy validator is to check for default constructor so we need to override that logic to reassure NHibernate we have things under control. It is pretty standard and not very interesting. We’re again using the INHibernateActivator, we’ve yet to discuss, to create instances. Also since we’re not calling any constructors to do it, we have to set the proxy dependencies that would otherwise by provided via constructor inline. For that we’re using some internal knowledge about how DynamicProxy lays out its proxy types. Good news is – we’re almost there. Actually we might want to also override NHibernate reflection optimizer. As its name implies replaces some actions that are performed via reflection with faster, compiled versions. The default one works with assumption that default constructor is available and may fail otherwise but we can disable that feature for our simple proof of concept application. We set up our standard stuff – mapping and connection string. Then we need to tell NHibernate to use our custom ProxyFactoryFactory. Then we build configuration object and set our custom interceptor to it. Having done that we can build session factory and give the interceptor reference to the session factory. Certainly not the smoothest ride but gets the job done. Oh – and as I mentioned we disable reflection optimizer so that we don’t have to override yet another class (two actually). That is all it takes to be able to get rid of all the seemingly superfluous constructors and have a much simpler model. Right – the activator. How do we make that happen? Here’s all the code in this class. Remember how I said that NHibernate can be viewed as fancy serializer? Here we make it obvious by using System.Runtime.Serialization.FormatterServices class to give us an uninitialized instance of given type. Uninitialized means that all the fields will be null or 0 and no code will be ran. This however is precisely what we want for the reasons outlined in previous post. We then throw the object to NHibernate machinery to perform all the necessary initialization for us, so that when the object is returned from the session it is fully created and usable. We could also implement a mechanism similar to one of the options that standard .NET serialization provides to allow the object to initialize its volatile state. That is all it takes to make the model a bit more persistence ignorant. Like I said this approach won’t work always. It requires full trust environment and probably if you have complex volatile state the solution will be too simplistic. I would be interested to hear what do you think about the approach in general. Can you spot any severe shortcomings or flaws? Do you like it? Would you use it? One of the first things you learn about NHibernate is that in order for it to be able to construct your instances and take advantage of lazy loading every persistent class must have the default, parameterless constructor. This leads to having entities looking like this (standard blog with posts and comments example). Notice the first constructor. It doesn’t do anything. As the obsolete message (which is out there to get compilation warning in case some developer accidently calls this constructor in their code) points out – this constructor is there only so that NHibernate can do its magic. Some people do put there initialization logic for collections, (especially when you use automatic properties) but I use fields and initialize them inline. In that case the constructor is pretty much useless. I started thinking why is it even there and that perhaps it doesn’t really belong to the class. But let’s start at the beginning. Constructors are special methods that allow an instance of a type to be initialized to a good state. Notice two important things about this definition. First, it doesn’t say that constructor creates the instance or that constructors are the only way to create the instance. Second, constructors initialize newly created object to their initial state so that anything that uses the object afterwards deals with fully constructed, valid object. The above definition very well applies to the other constructor we have on the Post class. That constructor initializes the Post to a valid state. In this case valid means the following. Post is part of a blog – we can’t have a post that lives on its own. Our posts need to be part of a blog and we make this requirement explicit by requiring a Blog instance to be provided when constructing Post. Post requires a title and a body and that’s why we also require those two properties to be provided when constructing a post. Posts are usually displayed in a inverse chronological order hence we set the Published timestamp. We do none of the above in the other, “nhibernate” constructor. That means that according to the definition of a constructor it is not really doing what a constructor is supposed to be doing. It is never used to construct an object. Let’s take a step back now. What NHibernate is doing with objects in nutshell is serialization. You create an object in your code and initialize it using constructor, do some stuff with it and then you save the object away, so that it can be retrieved later, after your app has been closed, or perhaps on another server instance. You save away the state of the object so that the state representation of the object can live longer than volatile, in-memory representation of the object. If you follow this path of though the next obvious conclusion is that if you have a load-balanced system and two server instances work with Post#123 they both are dealing with the same object, even though they are two separate machines. The conclusion of that is that when NHibernate is retrieving an object from the persistent store it is not constructing it. It is recreating an in-memory representation of an object that had been created and persisted previously. Hence we are merely recreating object that already has a well known state and had been initialized and just providing different representation for it. This process is called hydration. you can use deserialization callback interface to be notified when the object has been fully deserialized and then initialize the volatile state. you can use serialization callback attributes to be notified when various steps in the serialization/deserialization process happen and initialize the volatile state. you can use ISerializable interface and implement serialization constructor which is used to deserialize the object. Notice that only one of those approaches uses special constructor. Since as we discussed NHibernate doesn’t really need the default constructor (in theory that is), can we really get rid of it? Turns one we can (in most cases), and we’ll look at how to do it in the next post. There comes a time when you have to store in the database not only pretty objects but also some not so pretty data. For example, let’s take the classical entity – the invoice. Let’s say your application can receive invoice in three ways: by its own frontend, by email in rtf file, and by fax. In two later cases you may have a requirement to store the rtf file and the scanned fax as a proof in the database. How to approach that? For the sake of example let’s say we want to keep the rtf file as text (well, that’s what it is underneath), and we want to keep the scanned invoice as byte array. Let’s create the simplest mapping and see what NHibernate will produce out of it. As you can see, we get quite little space for our Rtf file – hardly any file will fit in 255 characters, and certainly not one created by Microsoft Word. If you check NHibernate documentation it suggests using StringClob for this, so let’s do just that. It also suggests we used BinaryBlob type for the scanned jpg so let us apply this change as well, and see how it affects the generated schema. …it will surprisingly be exactly the same. I’m genuinely surprised. Is there anything else we can do? Quick googling leads to this old post by Ayende, where he suggests the solution: specifying sql-type explicitly as NTEXT for the string column. However, as Scott White noticed, NTEXT is deprecated since SQL Server 2008, we should use nvarchar(max) instead. Since we also expect size of serialized jpg images to be higher than 8kb, we’ll use varbinary(max) instead here as well. As nice as the example from my previous post was (person having pets) it exhibits a problem. The problem is related to the fact that by their very nature associations in relational databases are bidirectional, whereas in objects they are unidirectional. Here we hit the mythical impedance mismatch. Often however we want to have a bidirectional association in our object model. Person may have a set of pets, but then each pet has its owner. Then we have another problem. What if we add a pet to person’s pet collection, but forget to set pet’s owner? We’ll get inconsistencies. The best way to alleviate that (or the best way I found. Remember that the big warning sign from the previous post still holds true) is to decide on using one side of association for manipulation, and have it modify the other. Here you see that when we set the Owner for a pet it takes care of removing the pet from the old owner, and adding it to the new one. Is it all we need? Well, not quite, we forgot about the mapping. Notice one important thing. In our many-to-one we have set the value of column attribute to be the same as the one-to-many end’s key column attribute (see Person’ mapping in the previous post or below). 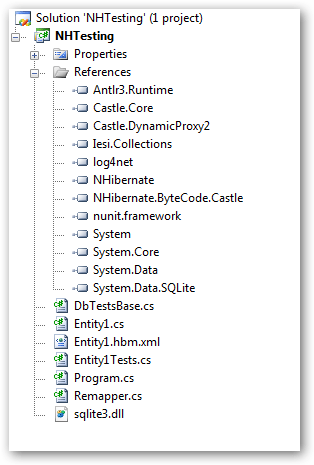 If we didn’t NHibernate would create two different columns for that and I’m not sure how it would affect the behavior. Probably it’s something you’d want to avoid. Are we done? Let’s see. When we run that piece of code, with the mapping we have, here’s what will happen. NHibernate will issue two INSERTS and one UPDATE (this is exactly the same SQL as code from my previous post would yield. The difference is, we can get rid of the UPDATE now). NHibernate Profiler shows us an alert by the UPDATE saying that its superfluous and if we used inverse=”true” it would go away. So let’s do just that. If we run the application now, the additional UPDATE will go away, as advertised. Ok, we can INSERT our association into the DB, so let’s now SELECT it back. The problem is that when creating Pet instances NHibernate sets the Parent property. Our setter tries to add the pet to Person’s Pets collection which is not initialized, hence the exception. So how do we fix it? Same as the last time. We want to bypass the setter and set the owner directly into the field. We don’t need our setter’s code anyway since at this point NHibernate takes care of maintaining integrity of the association. So we only need to add appropriate access attribute to our many-to-one mapping and we’re all set.